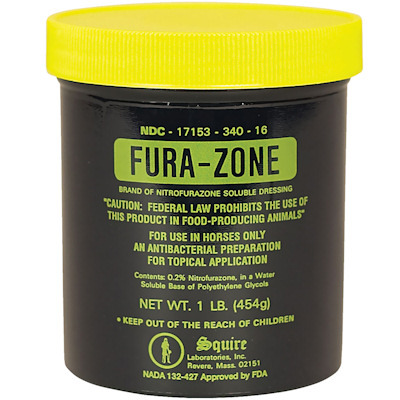 Fura-Zone Ointment - Sale Price $9.45/16 ounce jar, includes Free Shipping on orders that total $59 or more, not including vaccine. Fura-Zone Ointment 16 ounce jar. Apply topically for the treatment of surface bacterial infections, wounds, burns, on all animals. Provides antibacterial activity against a wide range of bacteria. This ointment is yellow in color.